Well, this certainly is a new one for us to cover on an auto blog. 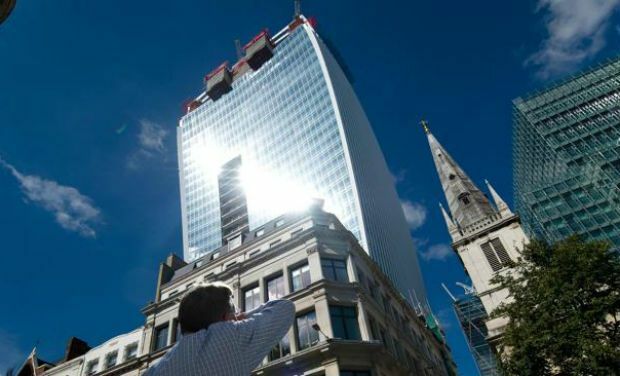 One wild story making headlines this week has to do with London’s latest skyscrapers called “Walkie Talkie” and how light reflecting off the building is so intense it can melt the exterior of cars. At least one car owner has officially complained to the builders as his Jaguar was apparently damaged recently by the buildings’ infamous glare. Jeez, between its draconian downtown car rules, high auto theft, sky-high fuel prices and now this, driving in England’s busiest city sure ain’t easy. For more on this story see the following Vancouver Sun article. This entry was posted in News and tagged Jaguar, London, Walkie Talkie building by northredline. Bookmark the permalink.